The Fifth-Grade classes at Edison Environmental Science Academy learned about raptors including Peregrine falcons with their teachers, Erika Zavasky and Linda Spicketts-Lass this past year. They incorporated the Kalamazoo falcons webcam as part of their learning. Ron Foor, Community President of Fifth Third Bank and Gail Walter, Peregrine Coordinator gave a presentation about Peregrine falcons towards the end of the school year and gave the students a homework assignment. The assignment was to help name the young Peregrines and we now have two unique and fun names for our youngsters. Male (Black 63/Blue R) has been named Sharib (pronounced ShaWAHdub), which is the Arabic word for mustache. Both male and female Peregrines have feather patterns on their heads that look like a hood and mustache. The Fifth-Grade class included several Arabic speaking students who are new to the community and the class had fun learning a few Arabic works, as their classmates learned new English words. Mustache is one of the first words they exchanged and as much as I am sure there is a delightful story to go with that, I don’t know what it is! Peregrine falcons are found on every continent except Antarctica, so students from the Middle East are familiar with falcons and falconry as part of their culture. The name choice reflects the Kalamazoo spirit of resiliency, cultural diversity, and acceptance of people and non-human species that have undergone challenges. The young female (Black 24 / Blue Z) has been named Apex. 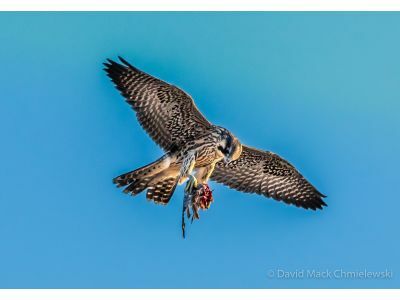 Peregrine falcons certainly live in high places on buildings and cliffs and are an apex predator. Our young female is still in rehab and now she has a big name to grow into. We expect that she will return home very soon and hope that her name will inspire her to fly high.